(Onscreen): Renee showed up on the screen, "Ladies and gentlemen, my guests at this time. The Shield," all three appeared, "And Gabby Bryan," I stood beside Seth as Dean and Roman stood on the other side of Renee. "Now, tonight, Seth and Roman will be defending the tag team titles against the Rhodes brothers. I just wanted to get your thoughts going into that match," Renee held the microphone towards Seth. Dean spoke next, "Last time, the Rhodes brothers had there old man at there side. Tonight, they are going to have an extra man to worry and tonight, Renee, justice will prevail." Renee put the microphone to Roman, "Believe that and believe in the Shield," the Shield walked away, but I stayed. Renee looked at me in confusion, I smiled at her and pointed to her microphone, "Do you mind if I borrow that quick." Renee nodded and handed it to me before backing off. As she left, I turned around and stared right into the camera, "Stephanie McMahon, I know you are watching and I have a message for you. You say that you are the queen of the WWE and I&apos;m going to give you a chance to show your reign. I&apos;m officially making out the challenge, you and me, one on one at Hell in a Cell," the crowd cheered in the background, "So if you are brave enough to show up at hell in the cell, I do to you what everyone has wanted to do to you since you and Triple H have started your little reign of terror. I am going to shut you up," I paused, "Believe in Gabby," I dropped the microphone and walked the direction the Shield went. Tamina was going one on one with Brie Bella. Tamina slammed Brie Bella in the face with the super kick for the win. "Ok, this is uncalled for!" Jerry called as Tamina started stomping onBrie. She picked Brie up as AJ got in the ring. AJ locked in the black widow. The crowd started cheering as I ran from the entrance and started running down the ramp. Tamina notice me first and stood ready to fend me off. I slid underneath the ropes and between her legs. I got to my feet quickly and clotheslined her out of the ring. AJ realized what was going on and let go of Brie and ran towards me. I ducked down and threw her over me, and made her clear the top rope. She landed on Tamina, causing them to both fall over. Brie moved out of the way, holding her arm, as I bounced off the opposite rope and suicide dived both of them. 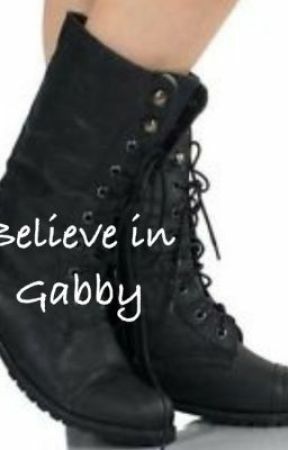 "Gabby&apos;s everywhere!" JBL called as I slid back in the ring. "Come on, I dare you to get in this ring right now!" I yelled at AJ and Tamina as Tamina staggered to her feet and helped AJ up. I walked back over to Brie and knelt down beside her as she held her shoulder in pain. I put my hand on her back, "You OK?" Brie shut her eyes in pain before looking up at me, "Thank you," she muttered instead of answering my question. I looked back at AJ and Tamina. AJ and Tamina to see AJ holding her title up, "It&apos;s my title!" she screamed, hugging it to her chest. I helped Brie backstage and Nikki came running over right away, "Are you OK, Brie?" she asked. I shifted uncomfortably as Brie answered, "Yeah, we should probably go to the trainers room though." "Ok," Nikki looked at me.